This is a cool office computer chair you really cannot miss! It adopts high-quality materials, sturdy and durable to use. Sponge-padded and ergonomic backrest for whole day comfortable seating. 360°swivel and casters for smooth move to everywhere. It is fashion with racing car appearance and cool with beautiful PU leather. Suitable for home, office or net bar. Fashion racing style, quite cool. 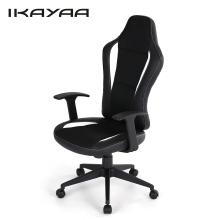 Thick sponge padded and ergonomic bucket seat for long time comfortable seating. 8cm height adjustable with safe pneumatic gas lift. Convenient to tilt the chair backward for relaxing with tilt lock mechanism. Both seat & gliding casters can 360°swivel or move smoothly on floor. Solid construction, durable & sturdy to sit. Perfect for home and office use: play computer game, listen to music, work etc. How to Use the Tilt Lock Function? This office chair also has tilt lock function: when you pull the gas lift adjuster outward, you can tilt the chair backward with your weight and back strength at your ease , or you can push the adjuster inward for not tilting the office chair. Seat Height: 42-50cm / 16.53-19.68"